EXTRA LARGE AND CLEAR: The e-pill Calendar Day Clock clearly spells out the full day of the week, month, date & cycle of the day in large, bold letters - with no confusing abbreviations. Cycles are preset to begin at: MORNING 6AM-9: 59 AM; DAY 10AM-5: 59PM; and NIGHT 6:00PM-5: 59AM. UNIQUE FEATURE: Set up to 6 daily alarms. Reminders can set for daily tasks, meals, and or for taking medications. Programming can be done with the keypads on the clock or with the included remote control. HIGH RESOLUTION AND LEGIBILITY: The e-pill Calendar Day Clock features a glare-free display to make exceptional legibility from every viewing angle. It can be seen easily from across the room and is invaluable for the visually impaired people. CUSTOMIZATION: The e-pill Calendar Day Clock has 2 language options in English, and Spanish. The display can be easily set to 12 hour or 24 hour (Military Time). 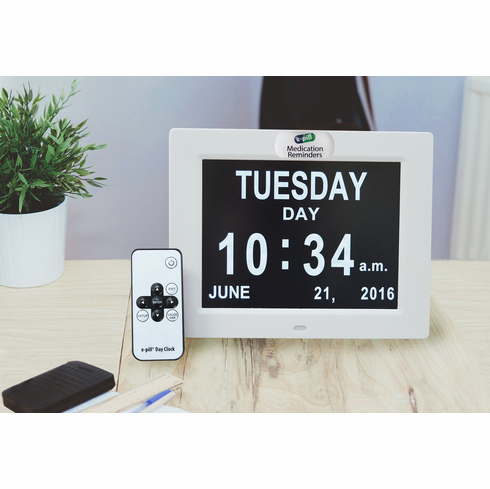 IDEAL GIFT: The e-pill Calendar Day Clock is the ideal gift for people suffering from Alzheimer or Dementia. The e-pill Calendar Day Clock can help reduce anxiety about the time of day and ease the worry of missing an appointment, medications, mealtime, or any other daily events. SPECIFICATIONS: Clock 8.5 inch (wide) x 6.75 inch (high) and features a 6.35 (diagonal) easy to read LED screen. Programming can be done with the keypads on the clock or the remote control (included). The clock operates with the included UL Approved AC adaptor. Does not run on batteries.